It occurred to the editors of Ibo that there was one basic question, so fundamental to the Christian life, that it demanded to be explored for greater profit of both ourselves and our faithful readers. Quite simply, the question was this: What are the ways Christ promised to be with us? “That’s so obvious!” the reader might cry. Perhaps. But it is nonetheless an important question. Unless we know the primary ways of encountering the living God in the bracing reality of our lives, the faith risks becoming an abstraction at best, an ideology at worst. There are four privileged ways we know of in which Christ manifests himself to his people in the here-and-now. Four writers are exploring these in a series of four short articles. The first was here, the second was here. This is the third. The soccer field stared through the Orange and Avocado trees. We left the more densely populated barrio, and walked uphill on a narrow pathway. After a couple of minutes, we stopped in front of a very small shack on the side of the pathway. Oscar, my companion, called out, asking if someone was home. He got closer to investigate, when the small wooden door opened. Oscar went to the front of the door and spoke to someone I could not see. A few seconds later, three shy little girls came out to examine the strangers outside. In no time, the entire family was outside socializing with us – the parents and their five children. This visit was part of my fieldwork with Jesuit Refugee Service (JRS) earlier this year in Cucuta, Colombia. I accompanied Oscar to check on some people that he had been assisting in recent weeks, people who had been displaced by war. The Martinez family was our last visit that day. A glimpse into their lives introduced me to the harsh reality of absolute poverty. I had witnessed poverty before. Unfortunately, I have become accustomed to see homeless people on our streets. I have met poor people on Native reserves all over North America, and small towns in South Dakota, Kentucky, and Atlantic Canada. Time and time again, I have seen extreme poverty in places like Chiapas, Mexico; San Pedro Sula, Honduras; and Lima, Peru. Yet, I had never met a family that was so destitute as the Martinez's. Meeting this family affected me greatly. I felt extremely uncomfortable with their poverty. It was almost painful. Their shack had a dirt floor with two thick sleeping mats where the entire family slept. Their only other possessions were a sack with clothes, and a broom. Aside from my discomfort with their scarcity, I enjoyed getting to know the family. They displayed a subtle joy, and a modest trust that all would be alright. The three younger girls loved to sing, and by the end of our visit I completely forgot how shy they first appeared to be. Weeks after my return to Canada, I realized that my visit with the Martinez family was the most consoling experience of my work with JRS in Colombia. I grew in faith, hope, and love through our encounter. It was not a pleasant experience, but it taught me much about myself. I learned that to contemplate Christ means being able to recognize him wherever he manifests himself. The Martinez family helped me comprehend something I knew to be theologically true, but which I had never experienced: Christ manifest himself to us in the poor. Pope Francis said it best when he stated in early July: “To meet the living God we must tenderly kiss the wounds of Jesus in our hungry, poor, sick, imprisoned brothers and sisters. Study, meditation and mortification are not enough to bring us to encounter the living Christ.” It is not enough to know that Christ is present in the poor. We need to meet Christ in the poor. We are called to embrace Christ, and to care for him in our poor sisters and brothers. Jesus told us that whatever we do for the least, which he defines as the hungry, the thirsty, the naked, the homeless, we do for him (Mt 25:40). To recognize that Christ manifests himself in the poor is not to romanticize poverty, as Dorothy Day would say. When we meet the poor, when we encounter poor people, see their faces, learn their names, hear their stories, and get to know them, we may be disappointed by their lack of gratitude or their coarseness. But God reveals himself to the poor and to the little ones (Lk 10:21), and through them he reveals himself to us. In the Bible, the Hebrew word for poor is anawim. It means those who are bowed down, those who are overwhelmed by want. The anawim of the Old Testament were the poor of every sort: the vulnerable, the marginalized, and socio-economically oppressed, and those of lowly status. To be an anawim meant to depend totally on God for everything. Christ reveals himself to us in the poor as he teaches us that our human vocation is to depend completely on him. The poor reveal God's presence to us because they rely totally on God for their sustenance. I do not intend to glamorize the life of people like the Martinez family, but I would dare to say that part of that joy I witnessed during my visit comes from the fact that they are unencumbered by too many possessions. The more possessions we own, the more they own us. The more possessions we have, the more time and energy we need to use in order to care for them, and keep them safe. I am not against possessions, but against the loss of freedom that comes from our greed for more. Certainly, I want to help people rise out of poverty so that they have the means to live fully, but I also hope that they do not lose the sense of joy and freedom that comes with having little. I stated before that Christ reveals himself to the poor, and through them to us. I have also learned that he reveals himself to the poor through us. This occurs when we acknowledge Christ’s presence in the poor, and we treat them as we would treat him. In the way we love and serve our poor sisters and brothers, Christ is revealed to them. In the ways in which we include the poor in society, Christ is revealed to them. God reveals much about himself in the poor, for we are all poor in some way. We are all overwhelmed by our wants. The more we open our hearts to Christ who dwells in homeless people, single mothers on welfare, prisoners, and other poor people, the more we open our poor hearts to Christ. To contemplate the face of Christ in the poor means to love and to serve them as we would love and serve Christ himself. In his Apostolic Exhortation Evangelii Gaudium (EG), Pope Francis invites us to consider an active contemplation of the face of Christ in the poor: “We are called to find Christ in them, to lend our voice to their causes, but also to be their friends, to listen to them, to speak for them and to embrace the mysterious wisdom which God wishes to share with us through them” (EG 198). Christ is calling us to contemplate his face in the poor. He has much to teach us through them, and he desires to love them through us. If we heed his call, Christ will reveal himself to us by small shacks, and lonely city streets. Let us pray that the Lord may open our hearts to those overwhelmed by want, that together we may joyfully rely on the Lord's goodness. 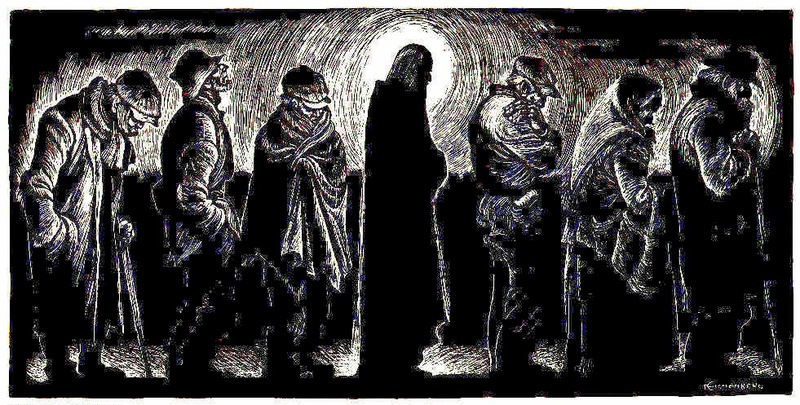 Christ waits for us in the poor. What are you waiting for? I will follow the 5 precepts of the church and also do the 7 corporal works of mercy.